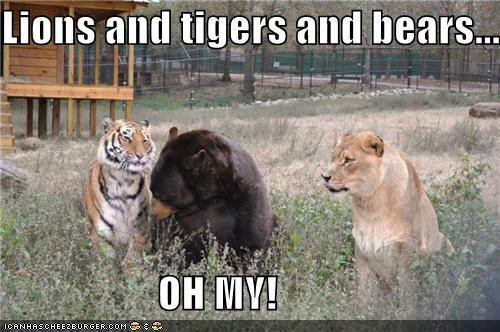 Yes, that title is a play on the phrase "lions and tigers and bears, oh my!" 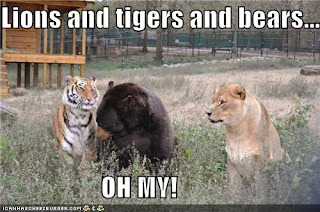 - but I don't deal with lions and tigers in Fort Mac (and bears only on occasion, really). This week my schedule is full instead with a different sort of beast - the kind that involves buffet meals and lectures and thoughts and ideas and new people and, quite likely, complete exhaustion at the end of it all - and I cannot wait, people. Today I will attend the Social Prosperity Change Lab, which I had heard about through others and was subsequently delighted to receive an invitation to attend. The change lab is directed mostly at non-profit organizations, but it's about community building in Fort McMurray, and is a part of the Social Prosperity Wood Buffalo initiative. I find the whole concept of "social prosperity" intriguing, from the name right to the people involved to the ideas it generates. So, I'm pretty excited to see what will happen at the change lab (which I find another interesting name, as it implies an "experiment in change"). On Wednesday I will attend another event hosted by Social Prosperity Wood Buffalo, but this time the full-day Social Prosperity Summit. Now, this one should also be fascinating, as it's about sustainable funding in non-profit organizations. One may wonder what exactly this has to do with me, a blogger with no role in non-profits, but it is an area of great personal interest. I think non-profits are vital to the social health and well-being of a community, and as such I follow developments in them with great interest. And besides, I always manage to learn something, meet some new people, and find some new ideas along the way, which makes attending events like this very valuable, regardless of my role in the community. And then, Wednesday night, the much-anticipated "Leading the North" conference begins! I've been looking forward to this one for weeks (hello, Peter Mansbridge?!?). There is a reception Wednesday evening to kick it off, a full day of sessions Thursday, a dinner with the premier Thursday night, and another full day of sessions on Friday. I'm actually quite excited about this conference as it will attract not only local folk but those from other places, giving me yet another opportunity to share my story of life in this community. My week is shaping up to be a busy one, people. It's going to be a week of non-profits and funding models and community ideas and speeches and lectures and PowerPoint presentations and "bear pit sessions" and receptions and dinners and lots and lots of coffee. And frankly, I can't wait. Other people can have their lions and tigers and bears - I've got summits and change labs and conferences, oh my!